Many who live in rural areas have well water. Well water can be the best water you have ever tasted, or the worst tasting and smelling thing you will ever drink. Private wells do not have laws governing the treatment and safety. Well water may become contaminated with any number of things, from heavy minerals to poisonous pesticides; the water you drink in your rural paradise may not be healthy to drink. Microorganisms are the number one cause of private well contamination. The most forms found include viruses and bacteria. Shallow wells are most susceptible to microorganisms. Heavy rains or flooding are common causes of bacteria or even chemicals contaminating the well. Shallow wells should be tested often for excess microorganisms. Heavy metals including arsenic, cadmium, chromium, lead and selenium are just a few of the dangerous metals that can contaminate well water. These metals are linked to many chronic and fatal illnesses in humans and animals. Young children and the elderly are most susceptible to the adverse effects of these heavy metals in well water. Most well water users live in places where farming is prevalent. Modern farming requires the use of fertilizers, nitrates and pesticides. These soak into the ground and will eventually end up in the ground water, which leads to your well. Animal waste from live stalk and even septic tank run off can also contaminate well water. Water contaminated with pesticides and nitrates is harmful to everyone, but is even more so to unborn children, pregnant women and children. While the government has implemented laws to reduce industrial waste contamination from factories is not as high on the list as it once was. Just like other laws, these too are broken and are a cause of well water contamination. Underground storage tanks and pipelines can become damaged and leach poison contaminants into the ground water straight into well water. There are any number of things that can contaminate well water. Just as there are many things that contaminate public water. Whether your tap water comes from public water supply or a well on your own property, using a high quality home water filtration product is a must. Some contaminants are visible, but most are never seen by the naked eye. Most water contaminants pose health hazards by either drinking or even bathing in it. Solid carbon block water filtration is reputed to reduce the most contaminants than other types of filters. Back in August, I blogged about the reality of the catastrophic water events that are happening right now around the country. The rains have yet to come and remedy this situation. In fact, it is getting worse. Currently fourteen communities are in danger of running out of water. I repeat, fourteen communities are running out of water! Over 30 million residents are affected by this catastrophic water shortage. If rains do not fall soon, many more communities will be in the same boat. The Water Resources Control Board reported a few months ago that twenty eight communities were in danger of having a major water crisis. Since then, a few have come up with viable plans to get water to their community, but the other fourteen have yet to see the light of a solution. What are these residents to do when the water runs dry? Moving is an option, but what about their current residents? How will they be able to sell their current property and fund a move? Who would purchase property in a dry community? These are many questions that will need answers sooner rather than later. Faced with a complete loss of water is a situation that many California communities are not familiar with. There is no protocol on what to do when the water completely dries up and millions of people are left with dry wells and nothing coming out of the faucet. What will happen to the residents, the businesses? The simple fact is nothing can live without water. Water is life essential for communities and their residents to survive and thrive. The New York Times once described the now desolate area in California the “food basket” of America. Eating a healthy salad in mid winter will be a thing of the past in parts of the country that freeze over during cold months. The price of a salad will increase as the ingredients will be difficult to find if these communities dry up and stop producing produce. What Happens to Mountains During a Severe Drought? As I mentioned in the August post on Catastrophic Water Events-Ohio and Lake Mead the lack of water brings forth a rainbow of water contamination problems to every area faced with losing their entire water supply. Certainly residents affected by these catastrophic water events will need to purchase a high quality home water filtration system to combat the contaminants that will no doubt infiltrate their water supply with a vengeance. Water emergencies are happening all over. From the drought in the Colorado River Basin to the algae in the Great Lakes, people are being told to conserve or just not drink the water. Lake Mead waters are at an all time low, Lake Erie is contaminated by a potentially deadly algae. There is speculation all over about what has triggered this algae to multiply. Global warming? Excess pesticide run off? I imagine someone somewhere will link it to fracking or GMOs. The white “bathtub ring” of mineral deposits marks the decline of Lake Mead, Photo courtesy of US Bureau of Reclamation. California is in a record drought, affecting over forty million people in San Diego, Tuscon, Los Angeles, Las Vegas and Pheonix. Lake Mead, the largest man made lake in the US is at all time record low levels. This causes a rainbow of safe drinking water problems. Some 40 million people – including those in Las Vegas, Los Angeles, Phoenix, Tucson and San Diego — and 4 million acres of farmland rely on water from the Colorado River Basin, much of it stored in Lake Mead. Lake Mead is currently at its all time low water level. Officials are monitoring how this will impact public safety. There are millions of people who depend upon Lake Mead for water. This is having a huge impact already. Today, the lake holds 9 months of water. At capacity, it can hold over 24 months supply. This means that right now, the communities who depend on Lake Mead for water can expect to run out in nine months! Less than a year, no more water in Lake Mead will devastate the area. Counties in Ohio and Michigan are reporting higher than safe levels of an algae that will cause illness if ingested. Indiana areas are seeing an increase of Ohio customers, purchasing water. As far east as Howe, Indiana, bottled water is leaving the shelves of many local stores. Many are coming from Michigan and Ohio because this is the closest place they could find that still had water in stock. Test show that the water has high amounts of microcystin, a cyanotoxin that can cause abnormal liver function, diarrhea, vomiting, nausea, numbness or dizziness. Skin contact with contaminated water can cause irritation or rashes. Anyone who is showing any signs of having had contact with the contaminated water should contact a doctor immediately. You should contact a veterinarian if any pets or livestock show signs of illness. Just these two events is having a huge impact on safe drinking water for millions of people. Events like these are on the up rise. 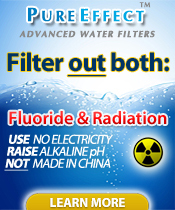 Everyone should have a quality home water filtration system. Emergency water supplies are vital as well. In nine months, there will be a bigger water problem.